← Who is this Ano Nuevo Man? John Vonderlin (JV): Last year while searching for the WWII observation tunnel the Pranksters were “trapped” in during the Good Friday Earthquake’s tsunami in 1964, I found the Graffitti Grotto, a sea cave, where Zane had carved his initials decades ago and informed him of its location. He gave me a dozen exclamation points, excited to be able to share a nearly forgotten part of his youth with his son someday. I bet he knows what became of the film. Russell Towle (RT): Zane Kesey sounds like maybe the best bet. I haven’t contacted him directly, not at all. disassembled? Do you know the last chapter of your driftwod home? RT: It was not acquired by eminent domain; Janet and Merrill merely got tired of living so very remotely, tired of the eternal wind. They sold to the State Park. The floating greenhouse, well, I personally disassembled it and hauled it piece by piece up to Janet and Merrill’s new place on Pescadero Road, in 1977, I think. I think we let the old iron pipes sink into the reservoir, but everything else came out. The driftwood cabin was clearly going to be swept out to sea, so, with Janet and Merrill’s permission, I decided to relocate it farther back in the dunes. I got about twelve people together and we were able to lift it up and carry it uphill, about twenty yards back in the dunes, where I had prepared a new spot for it. Then I decided to make it much nicer. I would attach an octagonal room to one end. I would put in curved rafters. This and that. It was already up on a pole foundation I had made, from tree trunks which had washed up on the beach. So I put a lot of work into a too-ambitious project and lived during that time in the Big House, then under construction. During the winter of 1971-72 some Boy Scouts who were camped on Cascade Ranch land, nearly a mile north, walked down and completely destroyed the cabin, and threw my tools all over the dunes, and stole my tools. I was able totrack them right back to their camp, where the adults took a haughty attitude, “Well, your residence is illegal, anyway.” True enough. There was no putting Humpty Dumpty together again. JV: There is a new $3 million Interpretive Center that just opened at Ano Nuevo in the old Steele dairy buildings. One of the buildings has rough hewn monster timbers that a placard says were recovered from a defunct local wharf. I’m assuming that was the Waddell Wharf that had carried lumber to waiting ships in the late 1800s. Do you think your timber was also from that source? Do you have pictures of it? RT: But how were these timbers stored, after removal from the wharf? I don’t remember a wharf at Waddell. There was one at Davenport. My timbers are mostly short, six or eight feet, they were just what was left after bulldozing and burning a barn. They are redwood and still show adze and broad-axe marks. One had an interesting carving of a human head in profile, but it has weathered away. JV: Meg, has been doing the Beach Watch survey from south of New Year’s Creek to the county line for several years, so I have become relatively familiar with some of the areas you referred to. I think your driftwood house was in what we call “The Forbidden Zone.” While I need a good reason to ignore the signs, I have hiked along that beach a few times to “clean” it of buoys, ropes, nets, tires or any other flotsam treasure I might care to carry the long way out to Highway 1. I’ve got numerous pictures of the area I’ll email if you want to take a walk down Memory Lane. not allow public access into the park from that end of things. JV: I’m assuming with a couple of years “on the frontline” you were able to observe Neptune’s rhythms intimately as far as flotsam is concerned. Your “calling” of beach treasures made me chuckle. After four years of collecting, photographing, cleaning, and sorting tens of thousands of pieces of marine debris I have come to believe through my observations that there are funny things going on in the offshore area that manifest themselves in almost magical ways on the beach. To look for a killer whale tooth in the same place you found one previously is not that illogical. Lightning often strikes in the same spot for reasons we often can only guess at. For instance, about a mile north of the Point is a minor vomitorium that occasionally kicks up non-buoyant marine debris en masse. Socks, sometimes as many as 40 at a time, show up there episodically, associated with the piling of wrack on the beach. Do you remember anything odd like that in that general area in the 70s? Did Stuart have favorite places to collect the debris he used in many of his pieces? fossils, but of a lesser quality and lesser degree of fossilization than the agatized pieces we would find loose on the beach. There were other places on the Point where the soft Pliocene siltstones carried whale fossils. You have no doubt observed that in winter, the sand gets stripped off that beach, Janet and Merrill’s beach, and the soft clays of the uplifted marine terrace are exposed, along with large masses of rounded boulders. We were conneisseurs of flotsam and jetsam, and Merrill was King so far as finding the oddest rarest things. Every day he would walk the beach slowly. He found many, many agatized whale rib fragments and vertebrae. He found quite a few Japanese fishing floats. In my years there I only found one glass float. The patterns are definitely interesting, by which such debris is washed up. from Japan to California via Alaska, more or less. Was it Alexander Von Humboldt who observed Chinese junks stuck in the mud at the mouth of the Columbia River? At any rate, they were there courtesy of the Whorl. That is, currents sweep the California coast from north to south, or northwest to southeast, to be precise. They are driven by, and accompanied by, the almost constant northwest winds. OK. Those winds actually sweep off warmer surface water and allow colder bottom water to well up to the surface. Hence, in part, the fog. The air is chilled below the dew point by the cold upwelling waters. So, knowing that so far as winds and currents go, we can label every promontory with a windward side, and a lee side, what should we expect? ce the calmer waters on the lee, south sides of promontories, might well trap things. allow gold and all manner of sediments to drop, to stop. The inside of bends is where the “bars’ of the 49ers are found. So after a fashion we might identify the lee sides of promontories with the insides of river bends. It is a little bit of a forced analogy but to me it makes some sense. Certainly at Año Nueov in partocular the north side, the windward side, is eroding under wave attack much much, much faster than the south side. Similarly, in our Sierra rivers, in their deep canyons, the outsides of the bends, where the water flows fast and furious, are activiely “degrading” or being eroded, while the insides of these same bends are “aggrading,” that is, more stuff added, than stuff taken away. But in support of the idea that the northern, windward, current-ward sides of points and promontories actually collect more debris, I have heard that that huge hook of land jutting far west into the Pacific, from north-central Baja California, right by Scammon’s Lagoon, is the best driftwood, flotsam and jetsam, and old shipwreck beach on the entire Pacific coast of North America. I have heard, but not seen for myself. JV: I was just looking at some 1972 aerial pictures of that area and I saw about a hundred artifacts in the blurry pictures that could have been your cabin or Bigfoot’s or Pete’s. Can you help me locate where they were? Are you familiar with the California Coastal Records Project? 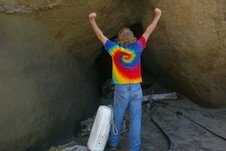 If you go to their website http://www.californiacoastline.org/ and search for image #6376 you’ll get a 2002 photo of Point Ano Nuevo. By hitting the “NorthWest 1” button you’ll move up the coast. When you find the photo that captures about where your cabin was, you can hit the Time Comparison button. That gives you all the photos from different time series of that same area. The photos are from 72, 79, 87, 2002, 4, and 5. By double clicking the photos you get the largest file for that shot. Unfortunately, the 72 and 79 photos are not of the quality of the later ones, especially the ones from 2002 and later, taken by the Adelmans. Can you see any of the homebuilt structures in the pictures? RT: I do not have broadband. I can put dots on the map. I’ll see what I can come up with. RT: Thanks John. It sounds as though you have developed quite an intimate acquaintance with that area. More than mere acquaintance. I’d suppose very few people know it as well. It is a very special place. This entry was posted in John Vonderlin, Russell Towle and tagged Ano Nuevo, John Vonderlin, Russell Towle. Bookmark the permalink.